As a programmed learning guide, this book will help prepare you for the FAA Private Pilot Knowledge Exam. The questions are organized to follow the presentation of material, section for section, as found in Rod's Private Pilot Handbook. Not only will this book prepare you for the Private Pilot Knowledge Exam, it will help you understand and absorb the knowledge needed to fly safely. You can test your knowledge and comprehension in each subject area with numerous weight and balance, performance, and flight planning problems. 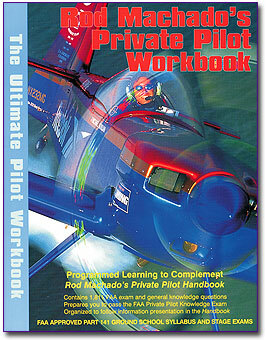 A thorough and complete self-study system when used with Rod Machado'sPrivate Pilot Handbook. Above each question in the Workbook is the PAGE, COLUMN and PARAGRAPH identifier to help you locate the answer in the Handbook. This is a great time saver! Questions organized to follow the layout of Rod Machado's Private Pilot Handbook so you can test your knowledge and comprehension in each subject area. An FAA approved, Part 141 ground training syllabus for use in an FAA approved Part 141 ground school.